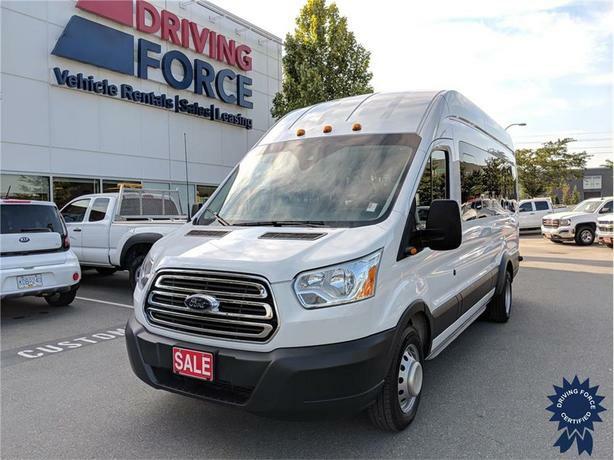 This 2017 Ford Transit XLT Extended Length High Roof 15 Passenger Van comes with a 148-inch wheelbase, dual rear wheels, 6-speed automatic transmission with over-drive and SelectShift, 3.73 limted slip axle ratio, 16-inch steel wheels, power driver seat, heavy-duty trailer tow package, dual heavy-duty batteries, tow/haul mode with trailering wiring provisions, trailer brake controller, all-around windows with 2nd and 4th tow flip-open glass, rear window defogger, privacy glass, running boards, AM/FM stereo with single CD/SYNC, remote keyless-entry keypad, reverse sensing system, block heater, HD 150-amp alternator, HD shock absorbers, front anti-roll bar, hydraulic power-assist steering, 95-litre fuel tank, and GVWR rating of 10,360 lbs (4,709 lbs). The 3.2-litre Power Stroke I5 Diesel engine provides 185 horsepower at 3,000 RPM and 350 lb-ft of torque at 1,500 RPM. Touch base with us to discuss purchasing or financing options that are right for you and experience the difference you will only find at DRIVING FORCE Vehicle Rentals, Sales and Leasing.